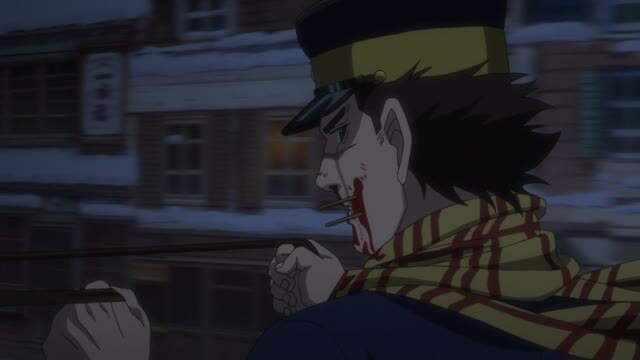 With this Golden Kamuy Episode 5, officially one month has passed since this anime aired. So kudos to you, if you are still watching. Many have dropped this anime due to its poor animation graphics and mostly jagged visuals. It’s a shame really, so far it has a captivating storyline which many animes this season perhaps lack the most. Especially when it comes to aiding their kits in terms of sterilization. A bit stellar how this anime likes to delve itself into two separate themes at the same time. I’m sure you noticed them by now. The historical/ cultural and the deep plot settings that this anime portraits so far. I do have to say one thing, I’m somewhat disappointed at how this episode was executed in terms of parts choice. I really wish that the first half of the episode had been the second part of the episode instead. It started off with a very action like atmosphere leaving you all hyped, that’s a certainty for sure. Of course, that would be a pseudo-consequence that would fall upon this episode’s cynical progression. So it was not all too bad. Looking at it from a different perspective, it just wouldn’t add up. 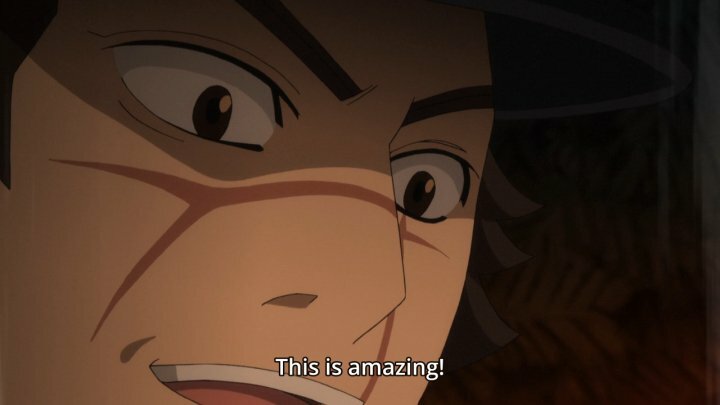 While many animes tend to just eradicate the previous episode momentum, Golden Kamuy didn’t. Which was brilliant. Because in a sense it never betrayed the fans expectations. Animes that do betray their fans expectations by simply adding new scenes and context which makes no sense most of the times. It entices a potential failure, if not a complete one. So I’m glad that this anime didn’t do that, it’s following an exquisite and occasionally well-formed road. Resuming the last scenes from the last episode. 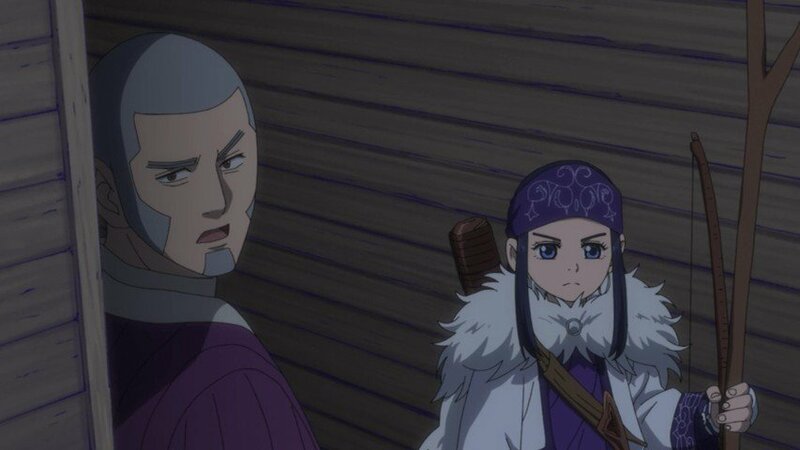 Asirpa and Shiraishi were both discussing on how to approach the general’s base in the village. It would obviously be vivid up there, as witnessed from the last episode too, the two brothers engage on Sugimoto. But he fought back with such malice that it was not possible for them to kill Sugimoto. The rest of the soldiers had to remove the brothers from Sugimoto’s ceiling, because, they would either kill him or Sugimoto would get their heads wiped on the floor. The second option was a possible one due to how well Sugimoto was executing his fighting strikes upon one of the brothers. Still, its rendered useless because Tsurumi decides to show up along with the rest of the soldiers. Seeing Sugimoto desperately begging for his life to Tsurumi either makes me think that he has a “Not Dying” complex or just a really obscure reason to do so. Ethier way, as Tsurumi says, his life was like a candle in the middle of the wind, which means fragile in this case. For Shiraishi to possibly enter the ceiling, he had to dismember some of his body joints as he mentioned. To help that happening, Asirpa offered a portion of a bear’s body fat that she had with her belongings. By wrapping it around his body, it made his skin way slicker and more transparent when it comes to passing through the ceiling bars. Eventually, Shiraishi ended up reaching Sugimoto’s ceil, although, he had to dismember his shoulder for that action to be possible. Even so, he just put the shoulder right back up causing almost no difficulties whatsoever. Reaching upon Sugimoto they have an odd talk. In an outer perspective, I’m a fan of comedy, but this anime feels so much better without it. Every moment that it involves a bloody event that contains action manages to shape this anime more hastily than random comedy, but some of it is tolerable. The moment Shiraishi tries to get the cuffs off Sugimoto, the two brothers show up. They wanted revenge on Sugimoto for their past humiliation, or maybe it was a just simple killing thirst that rained upon their desires. It didn’t portray very well, hence the result. They decided that one watching it from the outside of the ceil while one takes care of Sugimoto was an extremely good idea. Poor them, they were wrong, as Sugimoto steals the knife away from one of the brothers and defeats them in an excruciating way. Tsurumi was a little reluctant because of the brother’s capable actions. Yet it ended up only backfiring for him. He immediately sees Sugimoto on the floor barely living up his last moment or at least making it seem like that’s the case. You will see in a few rhapsodies of instants what I meant by it. Being so desperate for his life or just having the desire to escape at once, Sugimoto tells Tsurumi that he will give him all the tattoos he has. Which is funny, because they are all with Hijikata. Somehow Tsurumi is still convinced that aside from a great arsenal addition he can get anything out of Sugimoto. He is quite the foolish yet interesting character. To the point where he offers Sugimoto the chance to heal up in the best hospital of the town. Each character in this anime represents a great duality when it comes down to their tenacities. Take Tsurumi for example, he is so obsessed with buying those American Weapons that he will do anything to get those tattoo codes which will transpire into the hidden treasure. Obsession tends to be your worst enemy at times, simply because you forget what’s important. In this case, he did forget the main point, which was Sugimoto. He trusted his words way too easily. He could have simply checked the zone where he was supposedly bleeding out from and see if it was real or not. In the end, it was a mere speculation and assumption at the same time from Tsurumi. Assuring that Sugimoto isn’t faking it and that there are no routes for his escape if so is the case, Tsurumi claims that he shall follow him all the way up to the hospital. Before that, it was sort of interesting to see how Tsurumi made sure that the doctors would be up, ordering his soldiers to point a gun at their heads if so necessary. Now, there wasn’t exactly a definite clash between Sugimoto and Tsurumi, but an exchange of actions was traded. 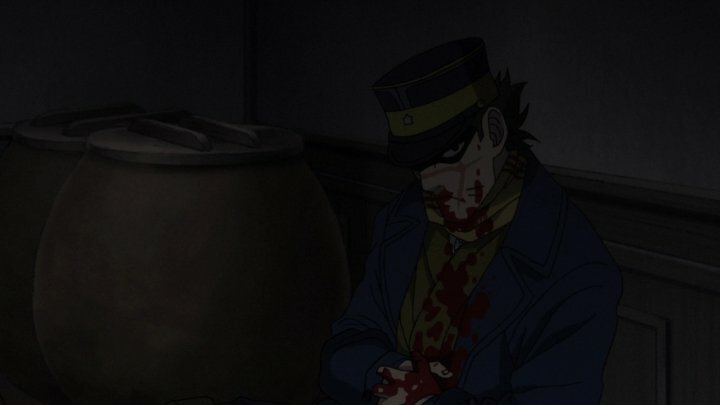 Sugimoto was faking the bleeding, he even took an extra blooded clothing of the brother with his blood to make it seem like he was bleeding. That was brilliantly played by Sugimoto I have to say. It was eventually foreshadowed in one scene where Tsurumi was investigating the brother’s corpse. It was concretely explained, but it served as an indirect explanation. Since his health was in a decent state, he could pull out some fancy moves, and so, Sugimoto does that with perfection, utterly. There were two soldiers along with him on the horse carriage. Neither of them suspected that Sugimoto could make a possible valiant attempt at getting from it. “No way, right?” Must have been their exact thoughts. Sugimoto swiftly handles both of the soldiers leading them to their deaths. With that done, he could follow up on the horse and lead the trail that would get him away. Unfortunately for him, it would never be a clean getaway, unless Tsurumi wasn’t constantly following him, which, was not the case. Tsurumi decides to raise up his gun to shoot forward but to interrupt the obvious outcome, Asirpa shoots up the horse that Tsurumi was riding on. Still, that doesn’t stop him, he continues to run and run until he reaches a peak where he points the pistol at Sugimoto from a very far distance. He gives some thought about it, on why to even shoot Sugimoto perhaps? It was never revealed such thoughts, but I would assume that he finds it a waste to kill such a valuable man like Sugimoto. In the end, Sugimoto escapes and Tsurumi is rendered with the realization that, Sugimoto and his crew are just essentially a better party to get the treasure, and not them. 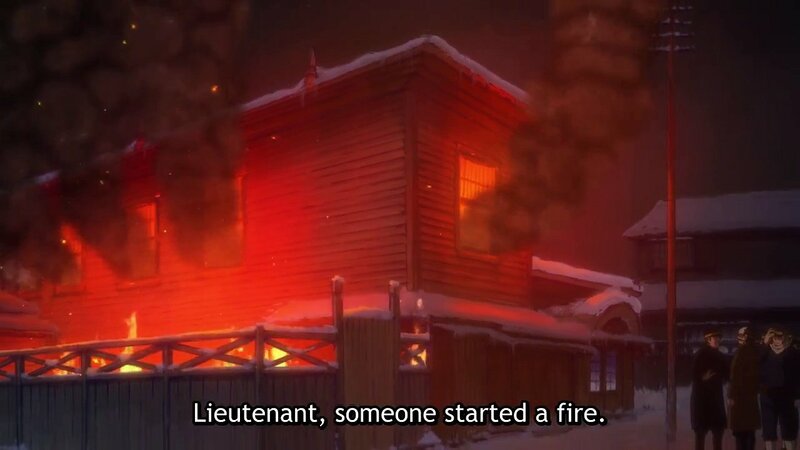 The true burning realization comes up as Tsurumi watches the entire base set on fire. Talk about a melodramatic contrasting view. 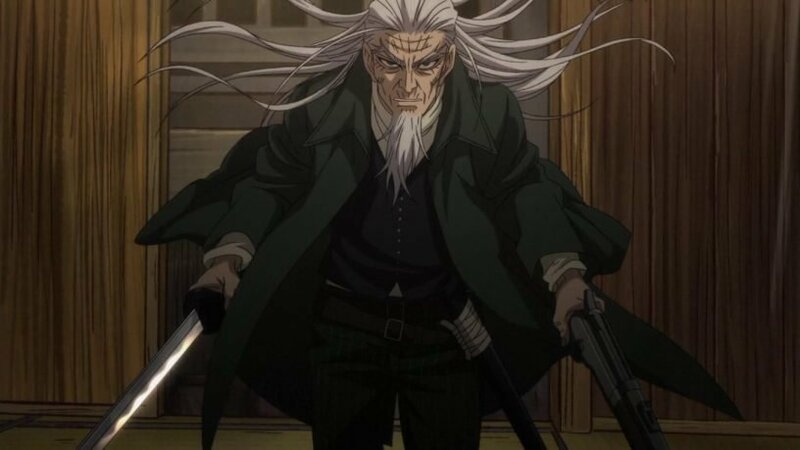 Molding a new momentum, the main antagonist of this anime is featured by having him, Nagura Shinpachi, the new character and the other old man with a special signature on his forehead. If you are a Gintama fan, you might have noticed the fact that this anime uses old forgotten Japanese names, like Toshizou and Shinpachi, which were present in the real Shinsengumi. Yeah, it’s not an anime thing only, it’s like the Musashi methodology from Vagabond, the same concept applies here. Which is amazing. If there is an element that can make a setting richer, especially historical ones, is realism. I always look forward to it. Because reality and anime/manga clashed all together form an amazing chemistry. On the topic though, Hijikata and Shinpachi were both choosing weapons because they were looking to widen their arsenal. Or more soldiers. Whatever choice makes you feel better, I guess. So they settle their minds and go down to their atrocious hideout. It was a bizarre solid house, therefore the aspect of it looked appalling honestly. As soon as the departure reaches the destination, Hijikata asks their leader if the message was transmitted to him or not. Through many mocking expressions, he reveals that it was indeed transmitted that way. Although, the message giver was to be found dead, so it was fair to say that they didn’t fall for the deal. It might have sounded like he did, simply because he said to Hijikata “You Win”. It was an alternative choice, yet a foolish one. The leader enhances a calling upon his squad to make the movement. He bluffed a bit by saying that of course. Yet the outcome wasn’t any different regarding its execution. Hijikata had already killed all of the leader’s soldiers outside, so that was going for him. Not only that, but he knew that there were hidden people behind the wood doors and by knowing so, he put an end to their lives, along with the leader. Subsequently, those events lead into an interesting conversation. Pretentiously, nobody would know what Hijikata would want with that treasure of his. He is the one who upholds the insane amount of gold. But apparently, he doesn’t know where it is as well? It’s a bit awkward, you would think that he would know where it was. But apparently, it was a mere vision. Hijikata does give us a valuable hint. When the man with the special signature on the forehead says that he is only in the deal for the gold and not some “Edo restoration”. Now this leaves you thinking. With all that gold, he could bring out the true independence of Japan, or just Hokkaido in general. Furthermore, his goals contrast Tsurumi so much. Because one desires Peace through Blood and the other desires war through blood. With all the bloodshedding done, we move on to the second part of this Golden Kamuy Episode 5. Earlier, I mentioned that I wanted the first part switched with the second for a very good reason. Well, if it’s a decent or good reason, it comes down to personal preference. The depiction of this second part lacked one thing. Which was a decent cliffhanger? Yes, it did leave a cliffhanger, but a very lackluster one in my personal opinion. Anyhow, let me explain the set of events, so you get the gist of it. Sugimoto, Asirpa, and Shiraishi both continue to follow the snow trail. Which I still can’t figure out as to why they are following the snow trail all this time. It’s not as if they have a map or some sort of direction to flow in to. I’ll assume it’s just for the fact that they are homeless and they have to stay up in the mini-houses all this time. Well, as for the new party, it’s essentially, Sugimoto, Asirpa, and Shiraishi, it will be interesting to see them working out together. I’m hoping that this anime delivers a few interesting fights, mainly Sugimoto vs Tsurumi. I can’t say the same for “Sugimoto vs Hijikata” because it seems rather one-sided for some reason. Although I hold no information on that. The rest of this Golden Kamuy Episode 5 is followed up with a food as the topic. I guess Asirpa finally accepted the way Sugimoto and Shiraishi ate up their foods. She felt somewhat subjugated because Sugimoto went out of his way all alone like her father did in the past. You can definitely see a love feat between this characters, rather small, yes, but it’s rather noticeable. Either way, this Golden Kamuy Episode 5 closes out with a new character being foreshadowed. I wonder if within the gap time of 12 episodes they will be featured properly. Only the future may tell us. This Golden Kamuy Episode 5 was pretty good. While the animation is not the best there is, it still can get around it, barely, but somewhat. I know for a fact that during this Golden Kamuy Episode 5 there was the CGI Bear once again, I guess it’s gonna be like that until the end of the season. It’s not exactly a good way to round up the animation, but it’s not very good, it’s contrasting some scenes that had the potential to be good, but with the CGI visuals it becomes somewhat sloppy. If you pay close attention to certain visuals elements, such as the facial expressions, the objects placements, you can see various fractions and frame slide mistakes. That can’t exactly go on a good page, it is a problem, and apparently, it’s gonna remain within this series until its end. I feel like there isn’t a necessity to tell you this anymore. If you let the animation aside, the plot itself along with its characters can give you a captivating thrill to watch, at least that’s my feels on this anime so far. Also, consider checking this article about the Spring 2018 anime, if you have yet to start your episodic adventures in this season. It’s never late. Do let us know of your thoughts on Golden Kamuy Episode 5.